WASHINGTON (Reuters) - Afghan President Hamid Karzai, in a meeting with U.S. National Security Advisor Susan Rice, proposed new terms for a deal governing troop withdrawal from Afghanistan and said he is in no hurry to sign the accord, the White House said on Monday. "President Karzai outlined new conditions for signing the agreement and indicated he is not prepared to sign the BSA promptly," the White House said in a readout of the meeting between the two officials. Karzai has persistently raised questions about the pact, which would enable U.S. troops to operate in the country beyond next year. 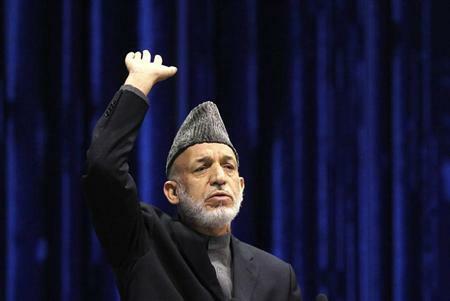 An assembly of Afghan elders on Sunday endorsed the deal and advised Karzai to sign it promptly. However, the Afghan president said he would not sign it until after a presidential election due in April. There should be peace in Afghanistan before the deal is signed, he said. In Kabul, Karzai's spokesman said the Afghan president wanted to the United States to halt all military operations on civilians' homes and return Afghan citizens held in the Guantanamo prison camp before the pact is signed. Rice, who made a three-day visit to Afghanistan to visit U.S. troops, told Karzai it is "not viable" to defer signing the deal until after the election, the White House said. "It would not provide the United States and NATO allies the clarity necessary to plan for a potential post-2014 military presence," she said. "Without a prompt signature, the U.S. would have no choice but to initiate planning for a post-2014 future in which there would be no U.S. or NATO troop presence in Afghanistan," she added. U.S. troops have been in Afghanistan since 2001.